A Pennsylvania district court judge blocked the Trump administration’s exemptions from the federal birth control rules from taking effect. Ohio’s new governor Mike DeWine signed an executive order barring anti-LGBT discrimination in state employment. The 10thCircuit held that the white supremacist Church of the Creator does not qualify as a religion. The European Court of Human Rights found that Greece violated a prohibition on discrimination by applying Islamic religious law to an inheritance dispute. Karen Pence returned to teaching art at a private Christian school that does not allow gay students and requires employees to affirm that marriage should only be between a man and a woman. 124 House members introduced the Freedom of Religion Act to prohibit religious discrimination in our immigration system. A jury awarded a Miami hotel dishwasher $21.5 million, finding that her employer violated her religious rights by scheduling her to work on Sundays and ultimately firing her. Indian Home Minister Rajnath Singh expressed concern over mass conversions and called for a national debate on the issue. A Florida lawmaker filed a bill requiring Bible study classes to be offered as an elective in public schools. Indiana governor Eric Holcomb called for a hate crimes law to target crimes fueled by biases over race, religion, and sexual orientation. A freelance religious teacher and his student have been issued restriction orders by the Singaporean government. 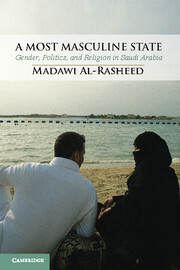 This month, Cambridge University Press will publish A Most Masculine State: Gender, Politics and Religion in Saudi Arabia by Madawi Al-Rasheed (University of London). The publisher’s description follows. Women in Saudi Arabia are often described as either victims of patriarchal religion and society or successful survivors of discrimination imposed on them by others. Madawi Al-Rasheed’s new book goes beyond these conventional tropes to probe the historical, political, and religious forces that have, across the years, delayed and thwarted their emancipation. The book demonstrates how, under the patronage of the state and its religious nationalism, women have become hostage to contradictory political projects that on the one hand demand female piety, and on the other hand encourage modernity. Drawing on state documents, media sources, and interviews with women from across Saudi society, the book examines the intersection between gender, religion, and politics to explain these contradictions and to show that, despite these restraints, vibrant debates on the question of women are opening up as the struggle for recognition and equality finally gets under way. Our friend and former guest Michael Helfand (Pepperdine) will be appearing with me at the US Commission on Civil Rights briefing next week, and he passes along his testimony. Michael’s approach to the religious institution question, as developed not only here but also in some of his other excellent work, depends to an extent on a very interesting (and, I think, provocative) concept of implied consent derived from the individual and granted to the institution. He locates some of the constitutional root of this idea in Watson v. Jones (1872). I will be appearing before the US Commission on Civil Rights next week, for a briefing whose subject is the conflict between civil rights and nondiscrimination norms. My prepared testimony may be found here. I’ve also reproduced it below (without footnotes). Thank you for the chance to testify before you today. I am an associate professor at St. John’s University School of Law. My work focuses on constitutional law, criminal law, and the law of religious liberty. The subject of our panel concerns the conflict of anti-discrimination norms and civil rights, and the specific civil right of our collective focus is the right of religious liberty. My prepared remarks divide into two parts. The first part considers the importance of studying and, to some extent, preserving the conflicts that we are considering. The wish to resolve a conflict sometimes can mask the depth and complexity of the conflict. Even more than this, an overeager desire to resolve a conflict can obscure the possibility that conflicts are part of every person’s experience, and, perhaps more controversially, that justice often does not consist of any sort of large-scale harmonious solution or consensus either within an individual or within a polity. The second part reflects on the ways in which our law attempts to negotiate around one specific type of conflict between non-discrimination norms and the right of religious liberty in the doctrine of the ministerial exception, which was recently recognized by the United States Supreme Court in Hosanna-Tabor Evangelical Lutheran Church and School v. EEOC. We are asked to consider certain types of conflicts—conflicts between and among rights. Underlying each of these rights are multiple values. The right of religious liberty includes within it the conventional values of liberty, autonomy, and equality, but also less conventional values like piety, asceticism, charity, devotion, self-control, fidelity, temperance, patience, and obedience. These are only some of the values that religious liberty can help a person or an institution to achieve, and therefore only some of the reasons that we should want to protect it as a right. It is not possible to understand what is valuable about religious liberty without also, as Catholic University of America President John Garvey has put it, thinking about what religious liberty is valuable for. But the values that underwrite the right of religious liberty can and often do intersect and compete with others that obtain in the particular social, political, and legal culture. Values against unjust discrimination are one such set. And conflicts arise whenever these various values of religious liberty clash with other values, so that a decision must be made in favor of some and against others. Conflicts can occur not only among different types of values, as when a religious organization’s autonomy conflicts with the state’s interest in a certain conception of equality, public welfare, or health, but also among different values of the same type, as when a religious organization’s conception of equality conflicts with the conception of equality contained in, for example, the Americans With Disabilities Act (ADA) or Title VII of the Civil Rights Act. We might be able to reach consensus in the abstract that equal treatment means the absence of unjust discrimination, but what counts as unjust discrimination is open to an array of conflicting interpretations, underwritten by conflicting values. [T]he Constitution contains values that may well exist in tension with each other, not in harmony . . . . The explicit terms of the Constitution . . . can create a conflict of approved values, and the explicit terms of the Constitution do not resolve that conflict when it arises . . . . A choice may have to be made, not because the language is vague but because the Constitution embodies the desire of the American people, like most people, to have things both ways. We want order and security, and we want liberty. And we want not only liberty but equality as well. These paired desires of ours clash, and when they do a court is forced to choose between them, between one constitutional good and another one. It is true, and everyone agrees that it is true, that when there are certain particularly powerful interests at stake—interests in protecting the weak from physical harm and abuse, for example—those interests should always trump any countervailing interest. But most conflicts between religious liberty and nondiscrimination norms are not of this extreme character and should not be analogized to the most extreme circumstances. Likewise, nothing that I have said about the justice of conflict negates the importance of compromise, particularly legislative compromise. But compromise does not mean harmony, or the absence of tension. A good compromise is one where the tension between conflicting forces and impulses remains, even after the compromise, perceptible and vivid. Because of the nature of conflict as constitutive of our lives, it is probable that our own lives could be characterized as a series of compromises between competing values. Much the same may be said of the institutions of civil society, very much including our legal institutions. In light of the clash of values I have described, one may well wonder how a court is to proceed in negotiating these clashes as a matter of constitutional adjudication. No matter how important preserving conflict may be, adjudication requires the termination of a specific dispute, and so it is necessary to consider what courts ought to say in carrying out their obligations. The best way forward for courts—the way that permits them to preserve as much of an existing conflict between religious liberty and non-discrimination norms as possible while fulfilling the duties of their office—is to decide cases narrowly and with close attention both to our historical traditions and to the factual particulars that shape each specific dispute. In these types of cases, courts should avoid issuing decisions that imprint a single value or class of values (whether, for example, those of religious liberty or of nondiscrimination) as categorically superior to other values. Decisions that are informed by historical compromises and our national traditions, and that reflect careful consideration of factual particulars, are preferable to those which proceed by reference to the all-out vindication of an abstract value, such as liberty, equality, neutrality, non-discrimination, or the separation of church and state, at the expense of all other goods. It is a fortuity that the Supreme Court’s most recent, unanimous, religious liberty case, Hosanna-Tabor Evangelical Lutheran Church and School v. EEOC, reflects just this approach to adjudication. As the Commission Members are aware, Hosanna-Tabor involved the issues of the existence and scope of the ministerial exception, a doctrine which recognizes that in certain contexts, the state’s interest in enforcing its nondiscrimination norms must be qualified by a religious institution’s interest in retaining control over employment decisions involving its ministerial employees. The Court concluded that the Hosanna-Tabor Evangelical Lutheran Church and School had the right to make employment decisions as to a “called teacher” in its employ, Cheryl Perich, who had sued the church pursuant to the ADA. Yet just as important as the Court’s recognition of the doctrine of the ministerial exception in Hosanna-Tabor was its methodology. The Court began by giving serious consideration to the history of “[c]ontroversy between church and state over religious offices” stretching back to the medieval period. It concluded that this history formed an important part of the foundation for religious liberty in the United States, especially the idea of church-state separation as properly understood—a concept which at its source has far more to do with recognizing distinct realms of temporal and spiritual authority than with the civic acknowledgement of religion in the public square. That history explains the source of the American commitment both to free exercise and disestablishment. And it uncovers a fact often hidden to the modern mind: church-state independence was first sought by religious, not secular, institutions. The Court rightly rejected the view advanced by both the federal government and certain of its academic supporters that this history should be ignored or marginalized, and that religious liberty should simply be subsumed within and reduced to the very different doctrine of freedom of association. Instead, the Court properly relied on both our distinctive tradition of religious liberty and the consensus view of the Circuit Courts of Appeals that the ministerial exception exists and is grounded in the First Amendment. We are reluctant . . . to adopt a rigid formula for deciding when an employee qualifies as a minister. It is enough for us to conclude, in this our first case involving the ministerial exception, that the exception covers Perich, given all the circumstances of her employment. What is important in these lines and what is reflected in the balance of the opinion is a highly particularized set of questions about the nature and function of the plaintiff’s duties—a suite of fact-specific inquiries—without reliance on any one of those inquiries as of itself controlling. The Court signaled that it will depend on this method, rather than any categorical rule or master value, to fashion the doctrine of the ministerial exception over time. And though its analysis was not ideal in certain respects, the Court rightly recognized that on balance, in light of what both Perich and the church understood and expected from the position, Perich’s job responsibilities were sufficiently ministerial that she should come within the compass of the rule. Yet the Court refused to extend that holding any more than necessary. It declined to opine on other kinds of law suits and other types of positions. And it did not adopt the view that churches have unbridled discretion to define any job as “ministerial” thereby to circumvent the state’s laws. That, too, was proper, inasmuch as the fact that a religious institution is involved in this type of conflict does not diminish, let alone erase, the state’s—or Perich’s own—interest in vindicating the equal application of non-discrimination laws. That interest remains powerful, even in the presence of a religious institution in the conflict. But the involvement of a church does qualify or complicate the government’s interest, introducing important competing values with which the government’s and Perich’s interests clash. It would be a mistake to select between these values categorically for constitutional purposes—choosing one set that ought to dominate the other set in all future cases. It would do violence to commitments each of which are important features of our political and legal traditions. It is true that narrow decisions may have costs. A narrow decision may provide less certainty than a broad decision; it may give prospective litigants less guidance; and it may leave the law less stable than is optimal. But that same uncertainty and instability may also promote compromise at the individual level; it may enable courts to communicate effectively with other government actors; and it may be more honest about the realities of constitutional adjudication—more candid and therefore more legitimate in a liberal democracy. Most importantly, however, narrow constitutional decisions avoid the trap of fixing in amber a monolithic ranking of values and interests. They reserve judgment for future cases and controversies. The Supreme Court avoided these mistakes in Hosanna-Tabor, instead adopting a highly particularized, historically sensitive approach. And it is that method, more than any specific outcome, which does justice to conflict when religious liberty and norms of nondiscrimination inevitably clash. Thank you for the opportunity to offer these remarks. Claire L. Adida (University of California, San Diego), David Laitin (Stanford University) and Marie-Anne Valfort (Université Paris I Panthéon-Sorbonne) have posted Muslims in France: Identifying a Discriminatory Equilibrium. The abstract follows. Evidence about the assimilation patterns of Muslim immigrants in Western countries is inconclusive because current research fails to isolate the effect of religion from that of typical confounds, such as race, ethnicity or nationality. A unique identification strategy allows us to isolate the effect of religion. Survey data collected in France in 2009 indicate that Muslim immigrants assimilate less than do their Christian counterparts, and that this difference does not decrease with the time immigrants spend in France. Experimental games reveal that the persistence of Muslims’ lower assimilation is consistent with Muslims and rooted French being locked in a bad equilibrium whereby: (i) rooted French exhibit taste-based discrimination against those they are able to identify as Muslims; (ii) Muslims trust rooted French and French institutions less than do Christians. Leslie C. Griffin (University of Houston Law Center) has posted The Sins of Hosanna-Tabor. The abstract follows. Aziz Z. Huq (University of Chicago Law School) has posted Private Religious Discrimination, National Security, and the First Amendment. The abstract follows. This essay identifies a negative feedback loop between private discrimination directed at American Muslims and security against terrorism. The first part of the loop is familiar: Concerns about terrorism animate greater antipathy toward outsiders. The second part is novel: social discrimination corrodes trust in the police and makes cooperation with police less likely. Insecurity thus creates discrimination, which deepens insecurity. The Religion Clauses of the First Amendment, now greatly weakened, still provide one tool to break this negative feedback loop. Here is the order of dismissal. The DCOHR did not reach CUA’s and President Garvey’s RFRA claims, relying instead on an interpretation of the DCHRA. One important reason, in the DCOHR’s view, for dismissing the complaint was that to do otherwise would lead to absurd results, such as compulsory unisex bathrooms and compulsory unisex locker rooms. Better to hold all of these practices outside the ken of the DCHRA. I applaud the decision. At the same time, I think it is extraordinary that in the current legal landscape, we are reduced to depending on the absurdity of forcing everyone, even if against their will, to accept unisex bathrooms, in order to conclude that a private religious institution like CUA can have men and women sleep in separate dorms. The toilet: our safety-net of common sense. Onto the next Banzhaf complaint against CUA alleging discrimination against Muslims, to which not a single Muslim student has put his or her name.